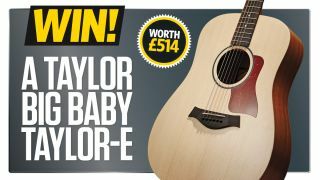 TG's Acoustic Of The Year could be yours! Taylor's Baby Taylor set the bar for small-bodied strummers when it launched nearly 20 years ago. It was followed in 2009 by the Big Baby, which Taylor overhauled in 2015 by adding the ES-B pickup system. It seems the firm did a great job too, because this is the guitar that you lot have voted as the best acoustic of 2015 in TG's end of year poll! Equipped with a spruce top, sapele back and sides and onboard preamp, the starkly minimalist Big Baby Taylor-E is the perfect guitar to get you gigging, and we're offering one lucky TG reader the chance to bag one this month!